There is energy in all moving fluids as you would suspect. Half of the mass moving through the turbine per second multiplied by the velocity squared. 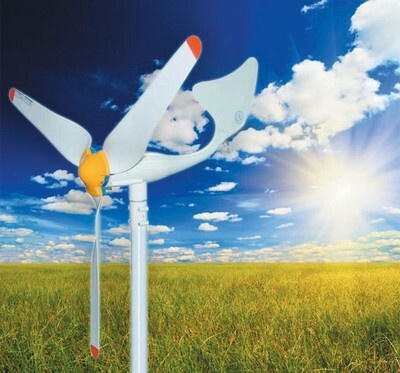 Ek: kinetic energy in Joules captured by wind turbine. ρ: Rho, density of air in kilograms per cubic meter. The relationship between air density and temperature is linear. Betz limit: Because a wind turbine works by reducing the velocity in the air and transfers that energy to the turbine, the air can only reduce in velocity so much before the wind simply wont move through the turbine. If we extracted all the velocity from the air, it would stop and pile up behind the turbine, obviously that’s not possible. It turns out this number is equal to 16/27 (59.25%). This number itself is a theoretical maximum based on the efficiency of the turbine design. That is the theoretical maximum energy we can extract from moving air with a turbine. Pat yourself on the back if you noticed that 8/27 was equal to 2³/3³.